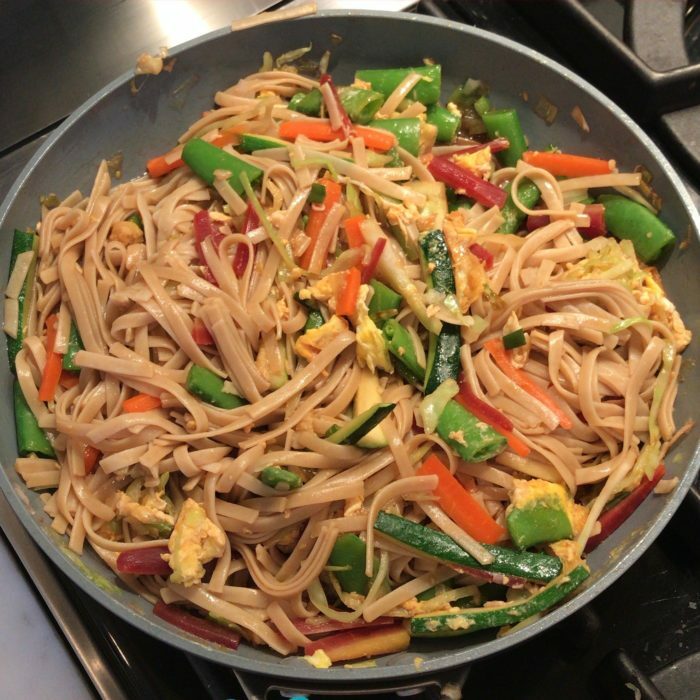 I find that asian food is always an easy way to get my kids to eat tons of veggies without complains. What I love with this recipe is that you can always adapt and use whatever veggies you have in your fridge, I have made this preparation so many times and have almost always done it a different way. Meanwhile sauté the avocado oil with the onions, carrots and zucchinis for a couple of minutes. Add the cabbage and sugar snap peas and keep on cooking until veggies are just cooked (you want the veggies to keep their crunch so do not over do it). Push the veggies on the side and crack and stir in the eggs. When the eggs are cooked, mix it all together, add the noodles and the sauce. Serve into bowls and sprinkle some sesame seeds to make it super tasty and pretty! You can easily add tofu or chicken, shrimps, beef or keep it vegetarian. Leftovers make a delicious school lunch the next day!